Son Also Rises cruised past its competition in the short 1,200-meter race to hoist the 2018 Philippine Racing Commission’s Grand Sprint Championship title at the Metro Turf in Malvar, Tanuan City, Batangas on Sunday. 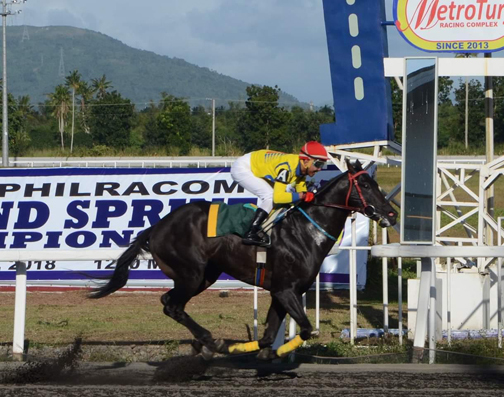 Son Also Rises proved his prowess as a sprinter by winning the Philracom Grand Sprint Championship at the Metro Turf on Sunday. With the multi-titled jockey JB Hernandez riding the Benhur Abalos Jr.-owned colt, Son Also Rises left his rivals behind with his calculated burst of speed in the stretch to record an emphatic four-length victory over second placer Pinagtipunan. Lakan set the pace early, but Son Also Rises made it a two-horse party in the final 400 before grabbing the lead in the last 150 meters and increasing his speed all the way to the finish for the four-length triumph. It was the duo’s first major stakes race victory together. “Madami na kaming panalo na minor races, pero ito ang unang malaki na nakuha namin. Hopefully, may mga kasunod pa,” said Hernandez. Son Also Rises bagged the P600,000 top purse for Abalos Jr. from the guaranteed P1 million total prize put up by Philracom, including trophies for its owner, jockey and trainer and the breeder’s purse worth P20,000. Pinagtipunan and rider MB Pilipil settled for the P225,000 for its runner-up finish, while Lakan and jockey RM Garcia pocketed P125,000 for third place. Fourth-placer Dinalupihan, steered by MA Alvarez, took home P50,000. Other winners for the day dubbed as the Pasay ‘The Travel City’ Racing Festival were Allbymyself in the Pasay City Barangay Trophy Race, Bwana Miss in the Cong. Emi Calixto-Rubiano Trophy Race, Edinburgh in the Team Legacy Trophy Race, Haring Bastos in the Pasay City Council District I Trophy Race, Don’t Underestimate in the Resorts World Manila Trophy Race, Princess Eowyn in the 4th Former Pasay Mayor Eduardo “Duay” Calixto Cup, Boom Tarat Tarat in the Pasay City Council District II Trophy Race, My Jopay in the 5th Pasay Mayor Tony Calixto Cup, Magnificent 7 in the Pasay City Vice Mayor Noel del Rosario Trophy Race, Tin Drum in the 5th Pasay The Travel City Cup and Crown in my Head in the Pasay City Engineer’s Office Race. Meanwhile, several stakes races are still coming in the final month of the racing season, namely the Chairman’s Cup, Philtobo Racing Event and the 2nd Leg of the 3YO Open Challenge Series on Dec. 16 and the Juvenile Championship, KDJM Racing Event and the 3rd leg of the 3YO Open Challenge Series on Dec. 31.